As I mentioned in the previous review, over our various trips driving through Buffalo, we’ve hit most of the major “benchmark” restaurants. We’ve been to multiple places for both beef-on-weck and wings. But there was still one classic Buffalo joint that I haven’t reviewed, and hadn’t visited for several years. And that’s the birthplace of the Buffalo wing: the Anchor Bar. While some of the other Buffalo area treats, like the beef-on-weck, have somewhat ambiguous origin stories, Anchor Bar’s claim as an inventor is one of the more credible, especially since it’s actually a somewhat recent invention (mid-1960s, popularized in the 1980s). 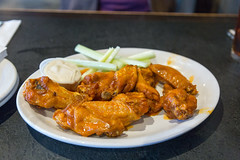 In any case, while the bar itself has changed (with several remodelings and additions), the wings themselves remain pretty much the textbook definition of classic Buffalo wings: wings fried up to a delicious crisp without breading (a classic case of “less being more”), and tossed in a mixture of hot sauce and butter/margarine, and served up with blue cheese, carrots, and celery, it’s truly a classic dish. I’ll be honest, I go back and forth over which wing place I like better (the other being Duff’s), but there’s a lot to like about Anchor’s wings: the skin is always crispy, the saucing spot on, and the results consistent (I’m pretty sure the product hasn’t changed since my visit in 1991). I can accomplish both at Duff’s, for example, but usually have to grovel to get them to crisp them up a bit. 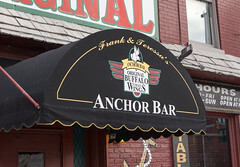 In any case, Anchor Bar is the place to go to get wings make the way they were originally intended to be. There’s also another benefit of the Anchor: they aren’t just a wing shop. They’ve also got a serviceable beef-on-weck. 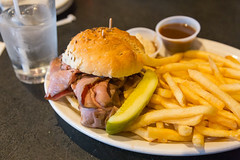 It has some pros (Anchor is one of the places that most reliably serves up their beef-on-weck the light-pink-bordering-on-bloody-red way I prefer it, for example), and some cons (I find the weck roll here to be soft compared to, say, Charlie’s or Schwabl’s), but it’s also nice to be able to get a good beef-on-weck at the same time as your Buffalo wings, and for that combination, they’ve got Duff’s beat. But really, the reasons you come here are two-fold: either you’re already in that part of town (most of the competition is further out from downtown), or you’re coming for the history. In either case, Anchor Bar is still producing some of the best classic Buffalo wings to be had anywhere.